Same situation today with a return to 1125 on light trading volumes. I guess we'll have to wait for another week to see some action coming back to the markets. The 1125 resistance level should act as a stall level rather than a breakout one today on this short dull day. We can maybe get some cues from TF which tested 625 for support yesterday as anticipated, and could now creep to 632 then possibly to the high 630s. 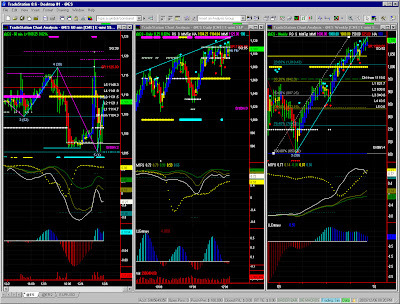 Note that TF may break out next week or early Jan and erase the retracement scenario we've seen on longer time frames. We won't jump to conclusions before we see an average 120000+ contracts traded daily. EURUSD bouncing nicely on short time frames. We would like to see 1.4404 tested for support to aim at the recent highs or possibly (although unlikely still) to high 1.45s. The overall trend is still quite bearish so congestion is to be expected at daily level between lows and abovementioned highs. That's all for this year. We have confirmation of the 1125 area as a strong resistance level for ES. However, to the point of being difficult again, we would have preferred seeing more volume on the high bar. Erosion is currently pausing on the 1120 area, but this drifting situation can continue to 1113 or even 1110. Again we don't anticipate anything really exciting this side of the year. Long time frames are nowhere close to turning around still. 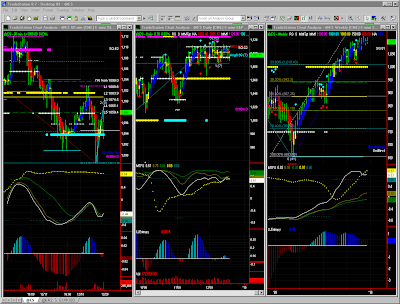 We did notice that TF went a little ahead of itself, ignoring the 625 level and following ES on its rise to 1125. TF should also drift but it is only if/when 625 is tested again that we shall gauge whether selling will at last start. Longer time frames (daily/weekly) show no signs of reversing, and retracement potential has even reduced substantially in the last couple of weeks. EURUSD has landed on Fib retracement level just above 1.43 but remains congested to bearish. 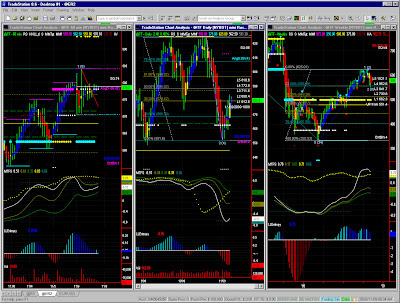 Shorter intraday time frames which can't really use in this report point for a limited recovery at first (Fib). We still aim lower over the next few weeks. 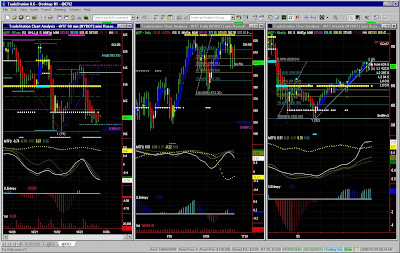 Note that reports will be posted on the ForeTrade Blog from next week. ES has now hit 1125, and it is only now that we can try and estimate opposing forces. Bulls still seem to have the upper hand at the moment but we can see that sellers are right there. One should not anticipate anything major coming until Monday, even though lower volumes can provide volatility and good trading opportunities in short time frames, but while the trading method remains the same, a daily report is not adequate here. TF is ahead of ES and remains marginally bullish. It is obviously easier when we have a good correlation across our indices between levels and patterns. We'll assume low volumes are the cause for this temporary confusion. EURUSD tested 1.44 as expected in our weekly report, and could even test higher grounds, at least until a Fib retracement level is hit. 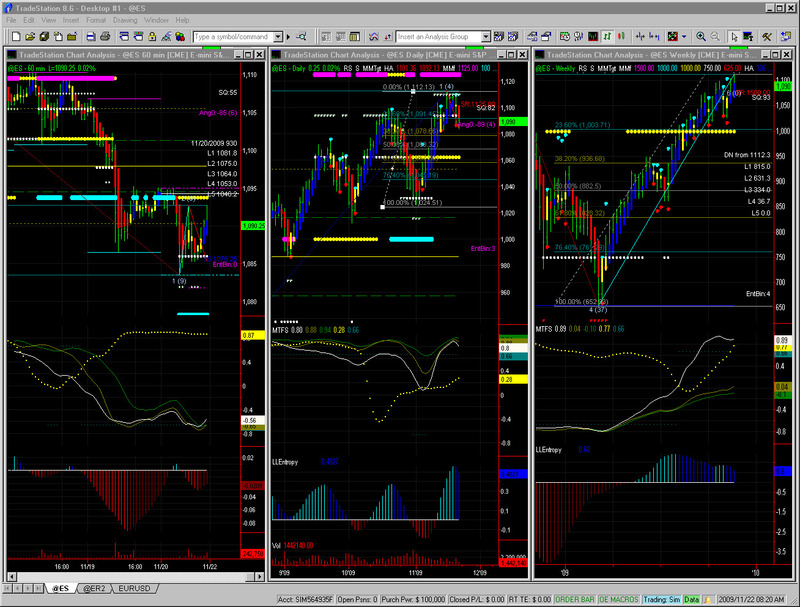 We do have conflicting forces across time frames so we'll safely aim at 1.443 then 1.447 if the brakout is confirmed. The more optimistic traders can maybe hope for 1.455 later on, but we'll tighten our stops along the way. 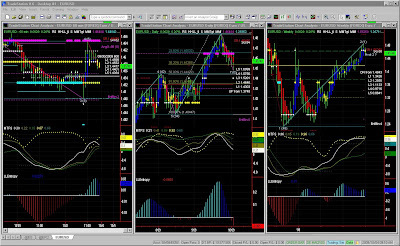 This MarketSnapshot blog will be kept maintained for more specific commentaries dedicated to TradeStation users, while the TSTT technical blog will specialize on programming issues related to the same TradeStation toolset. ES seems to bounce on 1094 for the time being. It could otherwise just hover fairly directionless in the price range below this coming week, i.e. between 1078 and 1093. The 1102 to 1104 area is a relatively strong resistance in the short term. We unfortunately have no indication of a forthcoming end to the confusion are for now, even if the substantial retracement anticipated on the weekly chart is still there for early January. Again, if we look at TF for correlation clues, TF has been testing 610 a number of times now and is still bullish in the short term. As mentioned in previous reports, we can discard both indices hitting their major resistance levels first (625 for TF and 1125 for ES). TF also has a Fib target on 618. In any case, buying pressure should be exhausted soon, even though volatilty may blur charts a little on account of slower trading. End of year 'window dressing' is also a common fund activity which can cause some apparently irrational market moves. EURUSD is in bounce territory now around 1.43, which could take it to the 16.4% (1.447) or maybe even the 31.8% (1.46) levels. The longer term trend is definitely down now, so we might see 1.408 by the end of the week. Note that we even have a combined Fib level on 1.375 within the next 6 weeks. Unfortunately, i won't be connected most of this week so there will be no daily market update. Next report scheduled for next Sunday. ES broke out on the downside as expected, so an easy day overall as ES behaved pretty well to just land on the next support level, respecting the usual price quantum. ES is now bouncing to probably test 1102 as resistance now. This remains a confusion area on longer time frame still waiting for the "big drop", so we'll stick to short time frames for now. TF also unsurprisingly stalled on 610 and still remains more bullish, so the last push to 625 in the next week is still possible. Again, we'll have to review the pullback scenario when we get closer to that decision point. EURUSD is now ready for a bounce if it passes 1.4404 today. However no change in dynamics in sight, so a possible upward retracement would stall on 1.462 to 1.1464 which is a very strong resistance area. The 1st 1.4404 level will be difficult enough to break already. 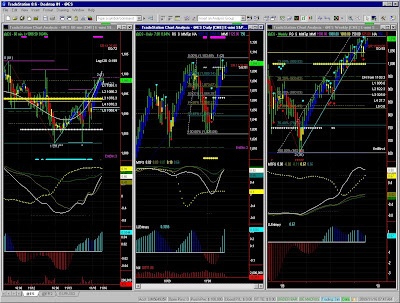 We will therefore check for MM/Fib levels on the 30 and 60mins charts. ES hovered in the 1100 to 1110 range as expected, and is now preparing for a possible breakout to the evolve in the lower price range with a support around 1093 (read TF below though). This is therefore the same continuation of the confusion area seen on the daily chart for about a month, and no indication yet of our anticipated retracement at weekly level. We'll have to be more patient now, and probably so until after the festive season unless to system shock perturbs the relative calm in the stock markets. TF also stalled on 610, a level clearly showing as a stronger and stronger resistance in short time frames, but is still pushing a little. We have to figure out whether this broader based index can take ES with it. ES would then instead move back to the top of the current range. 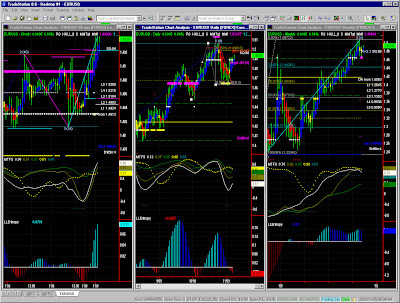 Since we do not have the usual high correlation, both charts will have to be monitored in short time frames. 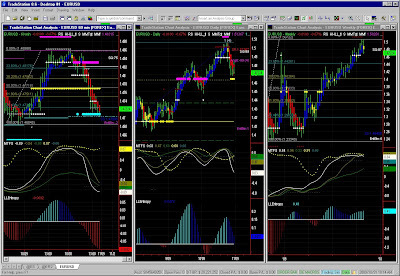 These markets remain relatively easy to trade in breakout mode. ES stumbled on 1110 and is now hovering in the same price range, from 1100 to 1110. MM range has narrowed which will inevitably end up with a breakout situation. At this point in time, we could be inclined to think that 1110 to 1112 will be tested again, possibly triggering buying to the next price range, and hit 1125 finally. Only then can we start considering selling more seriously, but we'll come back to that, knowing it can happen after the festive season. TF hit our easy 610 target as mentioned yesterday, and needs that extra push just like ES to go aim at 625. 610 will be tested again so we can prepare for a breakout situation (as well as for retracement) when there. EURUSD behaved as expected, and we'll check for our bounce today as 1.452 is a pretty strong support level in low time frames. We'll check Fib levels on our 60mins chart for resistance. Note the bounce can be fairly strong even if it takes a short while to materialize (daily chart). As mentioned on sunday, we had an easy long yesterday, with ES attracted like a magnet to the 1109 level, even overshooting it a bit. The level may a little hard to break, but there is still a slight upper bias and it would just make sense to make bulls happy and hit the target level once for all. Again a breakout situation can stop the anticipated erosion and unleash enough energy to take prices to the next range (1109-1125). 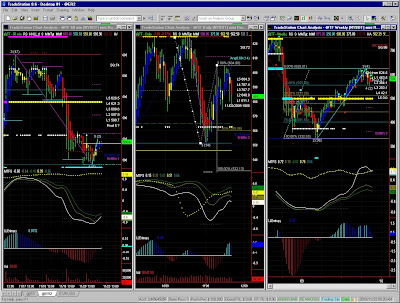 Shorter time frames are recommended (15 or 30 mins), just in case the current bias fades quicker than expected. If anything, TF is easier to read today. It is largely overbought, but is aiming at 609 now, even if it isn't clear whether it can go much higher. Here again, there is no indication of enough energy at this point in time to take it to the next price segment (610-625). We'll have to see how large banks tease with the 609-610 level first. As mentioned on the weekly report, bears are keeping it down, but it is important it holds the 1.464 area, otherwise we could have another sudden drop to just below 1.45. Selling pressure is certainly there still, so we'll watch that level carefully. Note that it can be penetrated down to recent lows and still lash back as the bounce potential is strong here. 1.476 would then be a rock solid resistance level. As mentioned on the weekly report, bears are keeping it down, but it is important it holds the 1.464 area, other we could have another sudden drop to just below 1.45. Selling pressure is certainly there still, so we'll watch that level carefully. Note that it can be penetrated down to recent lows and still lash back as the bounce potential is strong here. 1.476 would then be a rock solid resistance level. The last weekly report was pretty much on the ball even if it has been a chaotic week, yet not too difficult. At this point it is difficult to predict wheter 1109 will break though, as there is little energy left to allow prices to creep to that salient level instead of besieging it assertively. Whoever sold a few call spreads north of 1125 must be smiling ear to ear even if we are still waiting for that retracement still visible on the weekly chart. TF is also a little hesitant with an upper bias, with test levels (highs) around 600, a Fib/Stall level around 610. Like ES, it isn't quite clear whether TF will eventually hit 625, now turned to strong resistance level. We note however that the retracement potential at weekly level is slowly fading, with entropy about to switch back to momentum mode (versus reversal mode). We need it to be confirmed in the next few weeks, otherwise it will disappear. Shall we have our big drop early in the new year then ? We need that salient event on 610 or 625 to generate energy, either as a breakout on the up side or the much anticipated retracement. Markets always work in quantum leaps of energy and we can notice clearly the hesitation around 500 after the March recovery. We're now experimenting the same situation exactly 125 points higher. We would then aim for 750 again... We'll come back to that scenario also early Jan.
We can clearly see the quantum levels here too, on shorter time frames this time. After leaving 1.5136 to drop in a freefall, we are now in the 1.464 area. EURUSD is still fairly bearish in the short term, but should at least test 1.464 again early in the next session. Bears could try and keep it low, possibly for the entire day, where this bungee-jumping fall should then bounce back fairly briskly. At this point in time, a bottom for the day can be friday's low or at the very worst 1.4557 (stall level). Note that the expected bounce should not be strong enough to reverse dynamics, i.e. the US$ is later on likely to strengthen further or at least stay off recent lows. Current support area if/once broken could bring the € down to 1.41 but that's at least a month or two down the line, so we'll have plenty of time reviewing this scenario. ES hit 1105 as planned. EURUSD broke out as anticipated. Look for support on EURUSD though: 1.464 while penetrated can't really break today. 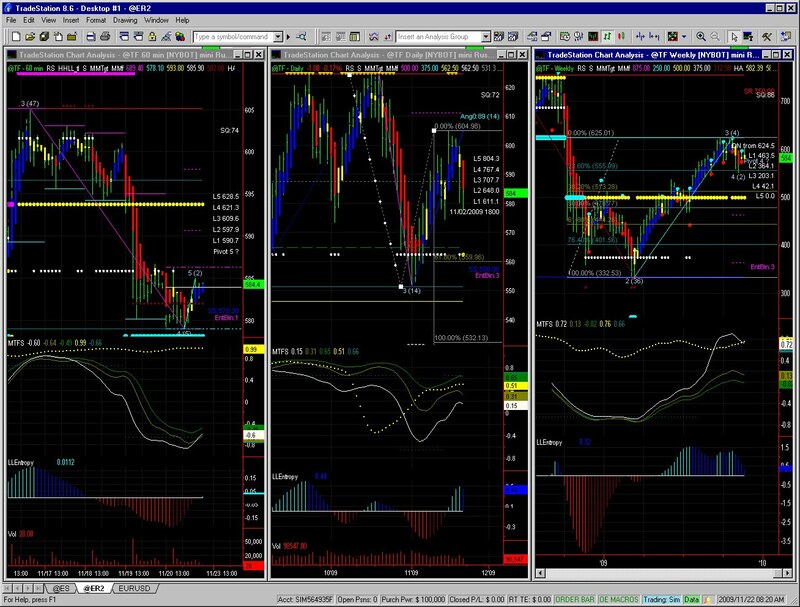 Traders are just aiming at Fib on 1.4611 where it will bounce and maybe stabilize. 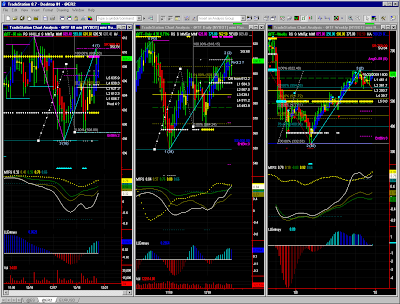 ES tested 1085 on the down side, then back to the 1093 pivotlevel yesterday. Overall it behaved as expected and should drift lower again today. The retracement scenario requires ES to stay consistently below pivot level (1093), and probably more or less like yesterday until 1086 then 1078. The daily time frame should then join the party. 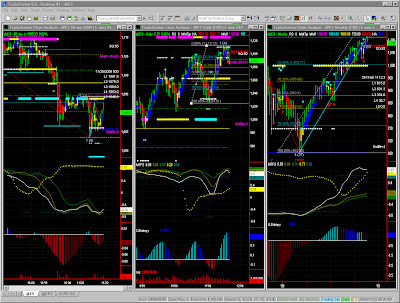 TF looks a little more resilient at first while being channel bound (30 and 60mins). 588 is a bounce level (Fib) for now which should keep prices in the same range. Shorter term shows a slight upper bias while longer term point towards some erosion, and despite these conflicting forces, the weekly chart still only shows a modest Fib support level (23.6%) hit a month ago which is not significant enough. In the short term, we will watch that prices remain below the 594 pivot level, to then possibly aim again at 588 (Fib test level) then 580. EURUSD should keep on drifting lower. There are support levels like 1.468 (stall), then probably 1.464 which is pretty strong. There isn't that much selling pressure though after the big drop seen these last few days. We would need another breakout situation to clean the books and speed up selling again. ES broke on the down side as we suspected yesterday, to hit and penetrate the 1093 level. The bounce on 1088 now needs to test that same level, then possibly 1100. The longer term retracement seems engaged now, however prices must first break 1088 more decisively to change price segment to [1078-1093]. Since the daily chart is probably too confusing for most to swing-trade, it is easier shorter time frames, maybe down to 15mins or lower. 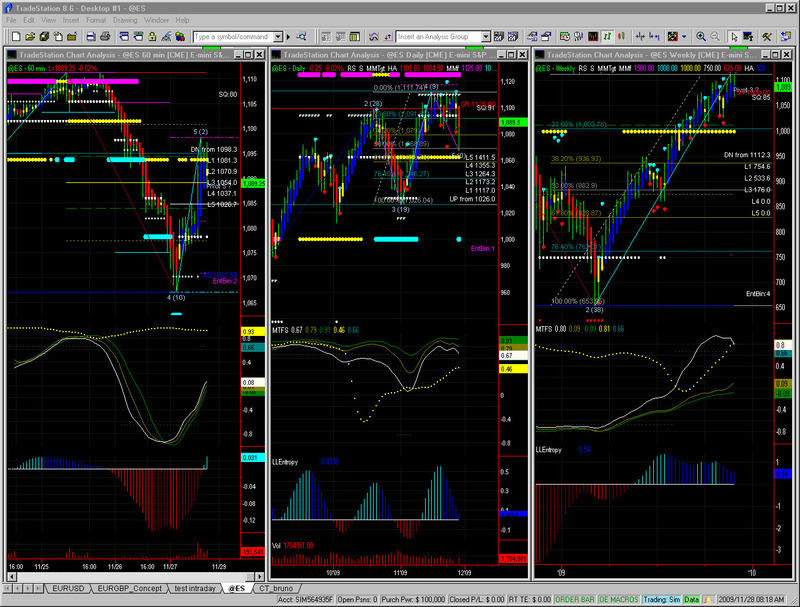 TF didn't hit 610 but stalled just above 605, which was more visible on shorter time frames as well. We still have very conflicting patterns across time frames at the moment, so we'll just focus on the short term trend which is down to the low to mid 590s and overall range bound. EURUSD did more than just drift... 1.482 indeed broke, opening the way to substantial selling. 1.472 is bounce territory (stall level) but 1.465 (or just above) is our target now. That level is however a lot stronger than 1.482 used to be. When it comes to chart reading, some days are easier than others, and it is often pointless trying to pick a direction. ES is going nowhere at the moment, range bound and slowing down, in hangover mode after Friday's volatility spike and waiting for triple witching next week. We can also expect end of year portfolio adjustments which can always create some surprise if volumes turn lighter. There is little to say about ES except that the range will breakout eventually, probably on the down side even if the exact timing of the anticipated retracement on higher time frames is difficult to pinpoint on our 30 and 60mins charts. TF is still trying to creep higher and this broader based index seems less correlated to ES, causing the current confusion. 610 would be our target here (MM/Fib). EURUSD should keep on drifting a bit but we do recognize that 1.482 is a strong support for now. Yesterday's lows could be tested again, but like with indices, there is no precise driving force at this point. What a day! Friday was the expression of the confusion i have indicated for some time. Swing trading as possible albeith difficult on shorter time frames and we should hope for volatility easing a bit on the way to the festive season. We'll still have to watch our for triple witching, but we'll have time to come back to this later on. ES ended close to MM/Fib pivot level (1109) where it could either return to some erosion mode or aim back at Fib expansion targets (1115, 1121). Should drifting resume, support on stall (1098) then strong support (1094) won't necessarily break that easily. We can indeed still see a channel on the daily chart, but difficult to say whether ES won't try and hit the MM strong resistance at one point (see screenshot). 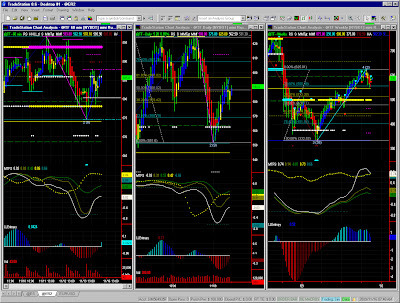 We will check for a breakout situation on the shorter time frames first. TF has also gone through some roller-coaster ride to end up near highs where it should aim towards 611 and probably higher close to the string resistance level on 625. Our longer term scenario of a substantial retracement (weekly chart) is still there but is admittedly slowly fading (EntBin down to 3). EURUSD reversed on the target provided last week, tested 1.507 for a while then dropped in a freefall. A bounce is possible to now test 1.489, but EURUSD should fall further to 1.477, then even possibly to 1.472. However this 1.482 support level is quite strong, so we can't discard the eventualiy of it holding for a while even though momentarily penetrated. We shall update this outlook during the course of the week. The confusion area clearly visible on daily time frame and hesitation on stall level made me pick the wrong direction (nobody's perfect), even though i was not even convinced myself. ES did not manage to push close to the (too) much anticipated resistance level on 1125. Again, i've indicated that in such case, shorter time frames are recommended. 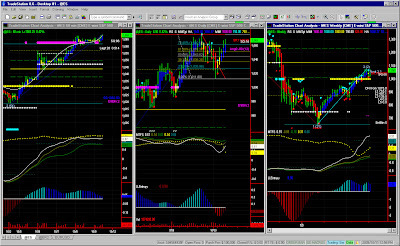 ES broke pivot level on the downside to aim straight at stall level (also Fib level) where a bounce is likely to 1105. Longer term players are however probably slowly gearing up for the sizeable retracement mentioned before, and options traders who've place the Dec call spreads above 1125 for a while are pretty safe. Breaking 1095 would mean changing price segment to then test lows again on the mid 1060s. TF stalled on 600 (see previous reports) to retrace to Fib and very likely lower today. 580 is our target even is a short term bounce is possible. The daily chart is just as confusing as ES, but we all know that the longer term retracement is probably under way already. 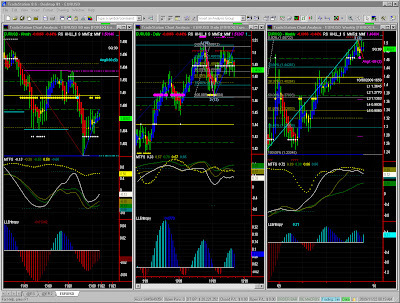 It is interesting to see the conflicting Fib patterns on the daily chart, probably confirming the change of regime. EURUSD is relatively easy to follow on shorter time frames. It should remain range bound overall, so probably a good day for easy going swing trading. I have mentioned on several occasions that this report is sometimes just not adjusted to the right market frequencies. In this case, the fog cleared up overnight to see ES resuming its rise, extracting itself from stall level and now aiming at 1125. This level being so much anticipated, it is not rare to see a reversal on stall level. Renewed bullishness now guarantees a fairly easy target. We shall review the longer term scenario this weekend, with with the channel upper line meeting resistance level. 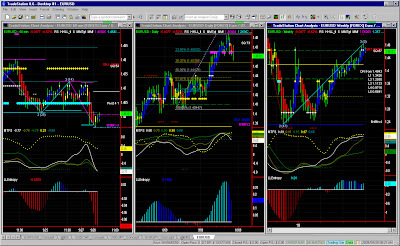 TF is as usual in a similar situation although it has already hit it target zone (MM/Fib Exp). Short term energy is there to possibly take it to 620. 625 on TF is the alter ego of 1125 for ES, but this would mean more ground to cover for the wider index. This should translate into quite a bit of fighting while arbitragers try and balance their exposures on pseudo-equilibrium points. Current level (1.512) is a Fib target on the 30mins chart so we may get there with waves. In conclusion, volatility makes it often difficult to grasp a picture for the whole day (unless i maybe use a 120mins chart). I would therefore welcome users of the toolset to contribute to this blog. I admittedly didn't give a clear picture yesterday and maybe should have resorted to the prevailing principle "go with the flow" when the trading environment is a little confusing. 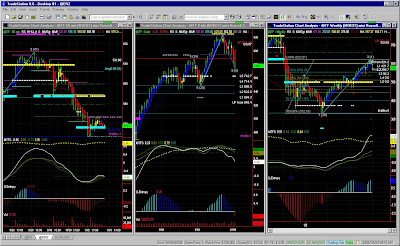 There are conflicting forces across time frames, and this daily report focuses on the 60mins chart with an outlook over around 3 bars, with support from the daily chart to help cover the entire day. I sometimes find the time for a midday update, but this report is free, so only limited time can be dedicated to it for now. TF bounced on stall level (565) on Monday to reach the other one (589) yesterday. As mentioned in previous reports, despite the obvious correlations, TF is ahead of ES and even if it could hit resistance level on 593, the drifting engaged on longer time frames should continue overall. EURUSD: highs on 1.511 (stall level) constitute a strong resistance where profit taking is nothing but normal. We again see no sizeable retracement, but having said that shorter time frames like 30mins provide a clearer pictures ans easier swing trading, which unfortunately cannot be commented on a daily report (at least 3 or 4 intraday updates would be needed). Yesterday showed how difficult it is to publish only one report per day, particularly in a "confusion area" and taking into account this method looks roughly 2 to 3 bars ahead. ES is a perfect example with a modest pullback on test level but not enough energy to pull prices decisively away from that level. ES therefore returned to the [1093-1095] area after hitting Fib PR1 (38.2%). What now ? ES is still under the influence of conflicting forces, creeping up on short time frames, and congested to drifting down on longer horizons. ES could therefore aim at 1100 to 1103 even though we are still in a down leg on the daily channel and still waiting on the "Big One" on the weekly channel. Admittedly, "Big One" is vastly exaggerated, but some of us are getting impatient. 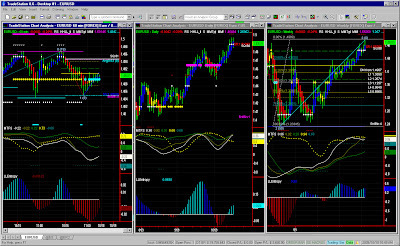 TF drifted to stall level (566) yesterday to go back to MM pivot level, yet is likely to turn south again. If anything, we appreciate that TF is easier to read than ES even though they are by and large correlated. EURUSD is also in a confusion area somehow drifting directionless. We have notices a fairly strong support area on Fib level (~1.4985). One can follow some obvious visible patterns like highest highs, lowest lows, or switch time frames. Lower time frames seem to show a retracement on the way down, but the the range is narrowing which will lead to a breakout situation. At this very moment, return to highs (30 and 60mins) is possible. I assume you have now noticed the test level on ES mentioned earlier and took a short. Some would have even gone for a options butterfly or placed breakout orders. EURUSD is also behaving as anticipated. 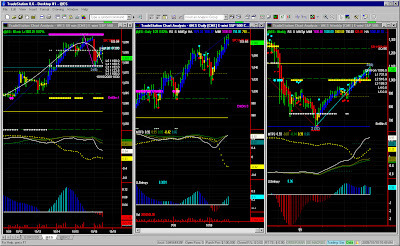 On Friday, ES bounced to 1095 (cf report) responding again pretty well to MM/Fib levels. The Dubai pseudo-bankrupcy was obviously a non-event to manipulate markets on a light volume day. Some traders have made a LOT of money on that kind of hoax. Anyway, looking at the forthcoming week, we are still in the same daily channel even though the "confusion factor"is increasing. This 1095 area is again a test level to try and test highs again around 1110 or follow the down Fib expansion pattern visible on the 60mins chart. In any case, we have only 2 scenarios either the channel on the daily chart hits 1125, or the pullback starts on current levels (with a high of 1112). In this uncertain environment, an upper bias is likely at first. 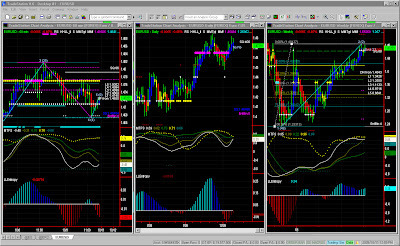 TF tested its MM/Fib target around 562, then bounced to 579 which a test level (also Fib/MM). It is following the same dynamics as ES and despite the same upward bias in the short term, lows should be tested again by mid week. To be quite honest though, I would wait for the market to settle a bit after the long weekend, so a mid day update would be justified. EURUSD: hit stall level on 1.507 with some residual buying pressure. A lower time frame would be recommended to pick a reversal short signal which could take prices back to 1.496 later on. 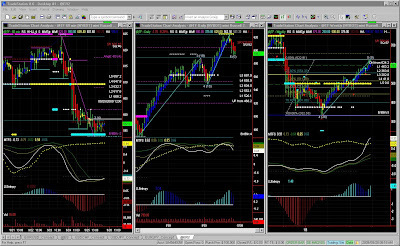 We will monitor MM/Fib levels when the MTFS is completed and sellers take control. Profit taking should remain limited. ES took a bit of a knock on Thanksgiving, only exacerbated by lighter volumes. It has now hit stall level on 1070 where selling should slow down and maybe even bounce. Reaching strong support level in the low/mid 1060s is however likely. On daily/weekly time frames, even though selling was abrupt we will only validate the "big slide" on a channel breakout. 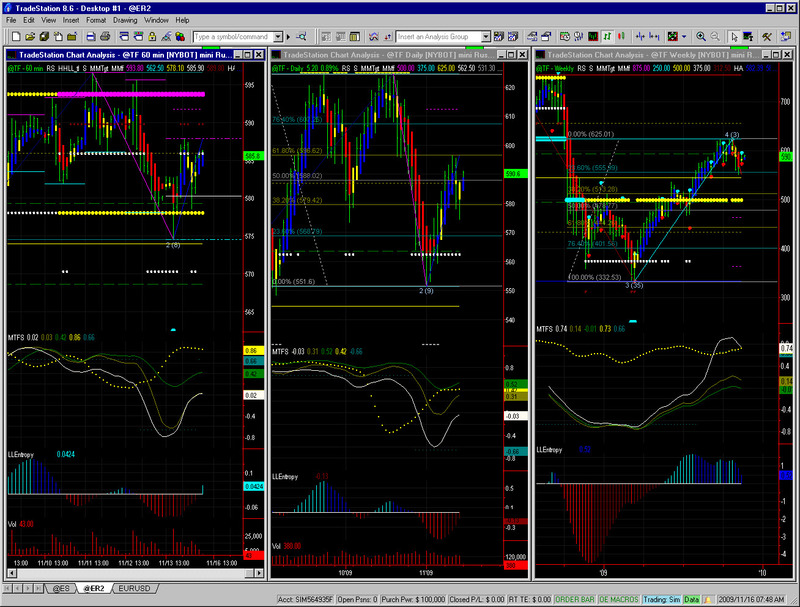 TF is already on strong support level, and on Fib/MM target on the daily chart. Current levels should hold for a short while, but it looks like the substantial retracement announcement a while ago is under way. If current levels are broken, the next target is in the low 530s. EURUSD has reversed quite abruptly to also reach a Fib target on current levels (~1.482). Selling pressure is still prevalent in the short run even if lows should hold for now. In case of a bounce, 1.489 (and then maybe 1.495 later on) will be test pivot levels which could send prices further down or not. 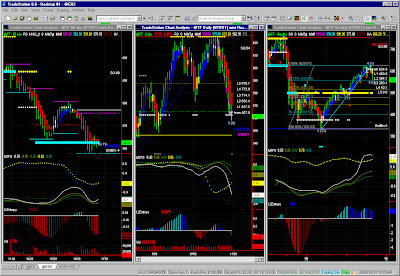 Mid to long term look a little messy, so shorter time frames are again recommended. Same confusion for longer term players, and same fun for intraday traders. 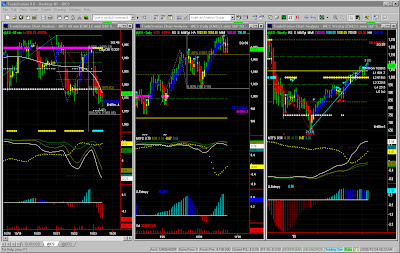 The trading range is known, so is our preferred time frame (30mins to 60mins). 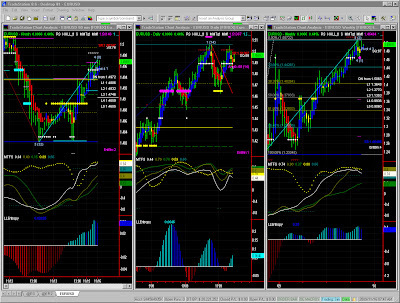 Levels are nicely demarcated with MM and Fib levels... so much so that the overall chart reading technique is just a little "add-on" to public domain stuff. So, ES bumped onto the strong resistance level to retrace abruptly. Test level will be the range lows now. Buyers may give up the fight and let the big slide begin. We'll first check 1095 (stall) and 1093 (strong support) for a possible breakout. Note that the daily chart is not indicating anything particular, hence despite this volatility spike, this is just the same congestion on that time frame. TF is also aiming at range lows around 580. We've been repeating that TF seems to be leading and while there is still a bit of fighting around the current range, a breakout to 560 (and possibly lower) is in the cards. ES hit 1095 briefly, which served as a test for the 1093 level mentioned recently. ES is now clearly testing the top of the range, therefore aiming at 1109. As we generally go with the flow, we have to assume it will try and breakout to go and touch the 1125 level, which would also be a channel high on the daily chart. We'll update the scenario later on. We first have to break current highs, which is in no way obvious. EURUSD: on the rise again, and aiming for the strong resistance level (1.5015). Yet, it should lose steam and only a breakout situation to 1.513 could affect the scenario. We are still in the same "hesitation territory" visible in longer time frames, which should translate into congestion for at least a few more weeks until the weekly pattern is completed. PS: It must be noted once again that this method is adequate for swing trading as it captures energy level in a quantum way. It does not always capture volatility as the outlook is generally 3 bars ahead, sometimes down to 1, sometimes as long as 5. It is therefore impossible to cover a full day using a 60mins chart, and mid-day updates are too time consuming at the moment. Thanks for your understanding. ES broke out as we suspected, even if we again didn't quite catch the volatility spike. Not too important for swing trading though. ES should try and test the same 1093 level today, and remain somewhat messy on the daily chart. This pivot announced on the weekly chart is certainly still hesitant. TF: same situation... Are we now going to see the much expected pullback...? Like ES, i don't think it will happen overnight. EURUSD: largely oversold on intrady time frames. It could test 1.49 (MM) again or 1.487 (Fib), but a bounce (spike) is likely. Again, the probability of a sizeable retracement is fading, and we could see more of this congestion for at least a few weeks. ES broke out on the down side. It was a typical breakout situation but i admittedly advised to cover both sides on a OCA basis. ES wiped the MM level to fall to the Fib level visible on the daily chart. Here again no surprise, and an easy trade overall. 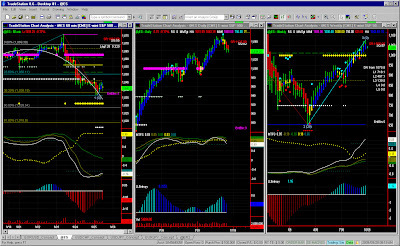 Today 1093 will act as a pivot levelto dtermine whether the index resumes south or not. Indicators will point timidly up to 1097 or even to 1102 but the job hasn't been done i.e. there are still a few sellers out there who will try and keep ES below 1093. 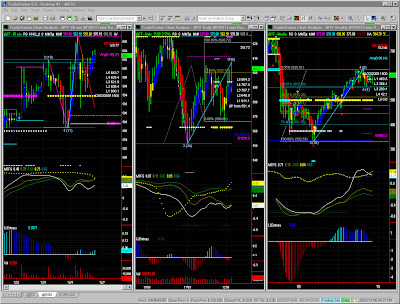 TF fell to stall level and should also try and complete the down pattern before moving on to a new formation. So, the strong support on 578 might be hit to make shorters happy, even if TF should try with much difficulty to move slightly higher (Fib Expansion). The 30 mins chart is easier to read and confirms the scenario. Basically, we're looking at a mild retracement up on the 60mins chart, some upward congestion on the daily chart, with the same weekly chart ready to swing down. EURUSD looks congested with an upward bias. We have an unambitious short term target at 1.494 for now. ES once again behaved as expected and stayed range bound between 1101 and 1110. In such a situation, a shorter time is always recommended to pick reversal points, the context being provided by the weekly chart. The residual bullishness there is still suprisingly resilient. Again, it is difficult to predict whether ES will hit 1125 before the substantial retracement we've announced for quite some time, but this is in any case a good breakout environment where we can place stop orders outside our 60mins chart's range. EURUSD follows the same clear patterns. After hitting a high on 1.4990 it retraced to first Fib target and should head further down. This remains a relatively messy situation, congested at daily level, and not quite ready for profit taking. Shorter time frames (30mins) are easier to read with the same support level on 1.4891 for now. A second Fib level is around 1.486 but we again can't guarantee EURUSD is ready to retrace to the 1.46 levels. The report yesterday indicated ES would try and aim higher, testing 1110 again, even if we are clearly in a 'confusion area' as this is also a reversal zone. The current Fib expansion pattern had a first target on 1111, i.e. in the same target zone. It could break out to the next one up (1118) or more likely test retracement levels just above 1100 or even lower. In other words, the 60mins chart will probably look congested again, which means that a shorter time frame may be recommended, taking in consideration the context provided by the daily/weekly charts. TF is hovering high near stall level, looking unconvincingly at creeping higher to around 610. A Fib target has been reached on 602. So, will buyers try and give it one last shot ? We hope to see time frames aligning for a clearer picture soon, and this probably on the way down. EURUSD: The signs of exhaustion mentioned yesterday actually turned into a sizable retracement to bounce to Fib (~1.489). 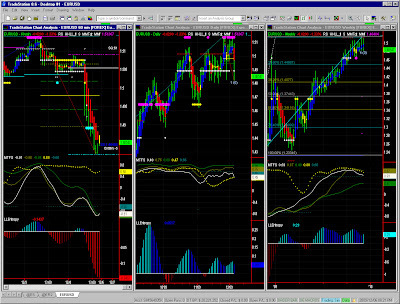 This pivot level will determine whether selling now resumes or not. Our indicators would rather point down, but rather to congest in this new trading range (yesterday's lows to pivot level) than fall a lot further. 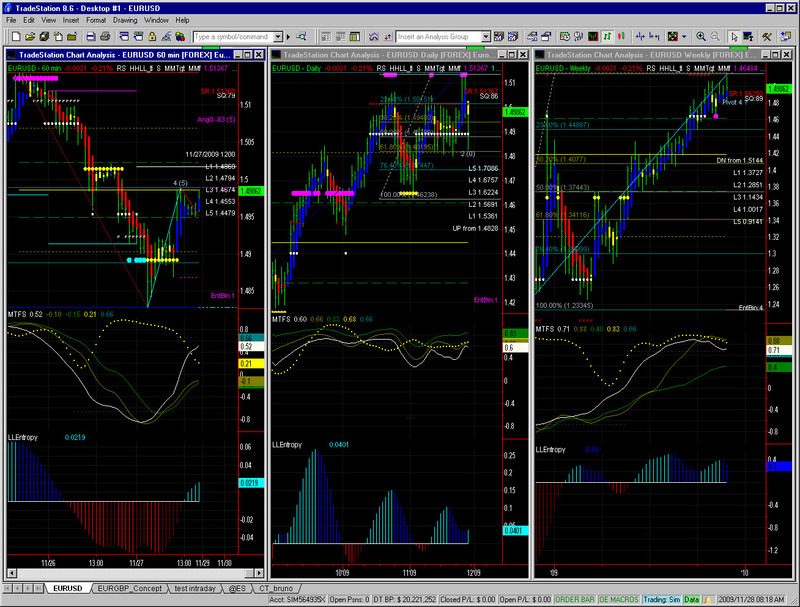 So far, so good... ES climbed as expected to hit resistance level around 1110 where it started retracing. Erosion to ~1100 would be normal (Fib/MM), and although improbably to the next Fib levels. 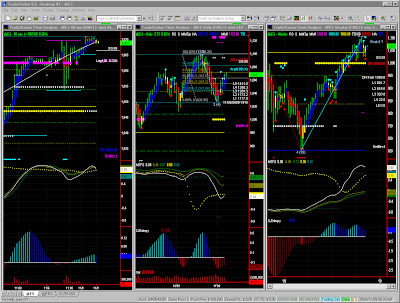 The daily chart still looks very bullish but may be losing steam and even stall ahead of the 1125 target. ES will at least try and give it a go in the next couple of days. The weekly chart is looking at peaking soon, so the context is known and understood. Providing this is in line with your trading style, lower time frames (15mins and 30mins) will be easier to trade. TF reached the 2nd Fib expansion target (602), i.e. a little higher than expected. It is now more hesitant ahead of stall level (605) and strong resistance (609). If TF carries on leading, it should try and take both indices a tad higher, but certainly with increasing difficulty. EURUSD was a little spiky yesterday, with larger players out there to clean out the book. €/$ briefly hit the resistance level on 1.501 again to then lose a bit of ground. Hesitation can help keep prices in current high range nicely delimited by both high and low spikes yesterday, but there are more and more signs of exhaustion going forward. 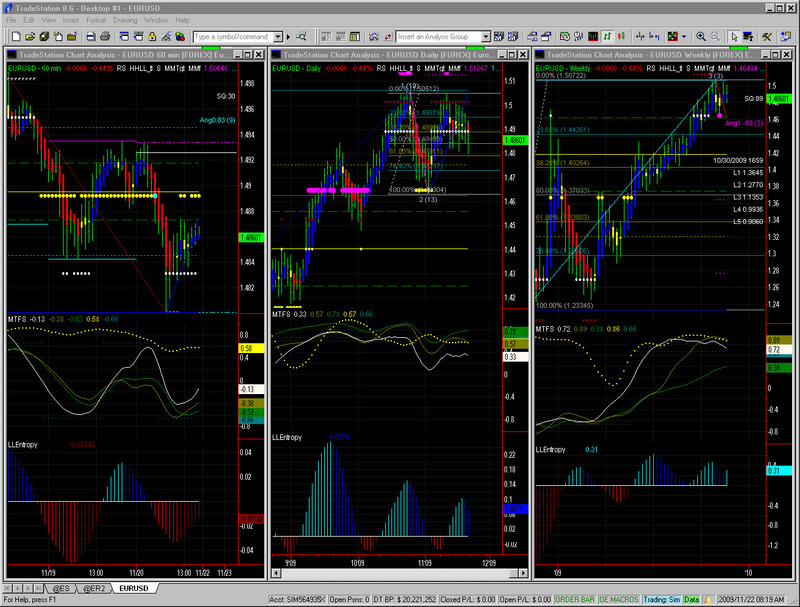 TF coincidently is also on a Fib/MM support level and is in bounce territory. However the profit taking is market more clearly and the buying pressure should be faster exhausted here. We're not yet in a clear down trend even if the market will try current support. EURUSD broke on the down side and could still go lower after a pause (early MTFS crossover). The daily chart shows buying pressure fading, and the current channel can only be sustained if we have a series of higher highs, which looks unlikely now. Again risk-adverse longer term players should not rush into selling, but trading a 30mins chart or lower is certainly a lot more fun. I called it a "confusion area" yesterday with a breakout attempt which failed to reach the 1113 target. More of the same today with a possible further erosion to 1085 then 1079. Again, we have conflicting forces with some congestion in intraday time frames, a residual buying pressure on the daily chart and some indication of a forthcoming pivot on the weekly chart ! 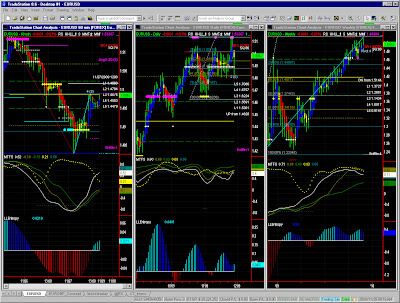 Overall, we anticipate a reversal even if the exact timing is difficult to predict. TF also hit the resistance in the low 590s as expected and should also retrace later on... Patience is a virtue, so let's not read too much between the bars. Although a pivot is expected on the weekly chart, one must always go with the flow and refrain from being contrarian and press the button too early. The technique is certainly more than dynamic enough to prevent acting too late in any case. EURUSD: Again a 30mins time frame gives better reversal points here. The €/$ hit support level to then test the pivot again, behaving almost like clockwork. We should see the same kind of congestion as with indices, with a likely return to support around 1.495. Unlike indices though, retracement potential is limited. Breaking current support could trigger some selling, but congestion is the same range is my favourite scenario for now. ES did not hesitate long on 1071 to break out straight to resistance level in the low 1090s where buying pressure is now easing a bit. We could see at best a modest retracement later in the day, but the daily chart is still quite bullish so we could aim to the top of the channel equating with strong resistance level around 1125. The weekly chart is again pointing for retracement but there is no confirmed pivot just yet, so a last bout of buying could indeed be the trigger we're waiting for. Note that dominant time frames are short intraday and weekly, which is unusual, and could indicate more volatility ahead. TF also followed suit and while it seems to be pausing ahead of its target, it should later on hit mid-590s. We'll try and make some sense out of levels as we get near those levels to gauge whether it could indicate a good reversal point for both our indices. TF is certainly more "ripe" for a reversal even though there is an obvious congestion on the weekly chart now. EURUSD: hit its target area around 1.499 to 1.502, so some profit taking is good measure now. EURUSD should stay relatively high but hesitant and probably range bound also. It is indeed an important target point on ALL time frames including Monthly. ES found it difficult to pass the mid 1050s as mentioned yesterday to then fall back to a regular Fib level in the low 1040s. Nothing exceptional here. While erosion should continue, we are now entering a phase of uncertainty until lows inthe 1030s are tested and fought again. 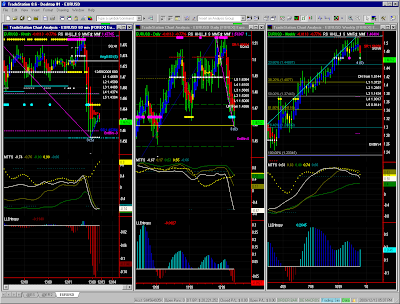 A new set of time frames will be helpful here. Volume based charts are quite appropriate for instance. TF is also both bearish and hesitant near support levels. The low 560s must be broken more decisively to open up to new support levels in the mid 540s. There is however some bounce potential along the way at least at daily level for now. EURUSD: Now that it has retraced to MM/Fib around 1.489, a pause is nothing but normal. We may now enter a period of hesitation with a support level on 1.48 (check Fib levels on 60mins chart). As time goes by, the retracement potential on the weekly chart will keep on fading, and while there could be volatility or congestion, we may have to wait for a MTFS crossover in a couple of months to start seeing a change of regime. How far ahead ... ? Not an update... just a reminder on the topic: How far can we "predict" the market behaviour ? Indeed, i have said repeatedly that the tool set as it is does not capture volatility very well "mea culpa" but at the same time, if we use it for its intended purpose i.e. swing trading, turning points, targets, energy levels and support/resistance do provide collectively a more than adequate picture. ES behaved pretty well and stayed above 1032 as expected. It may even try and creep higher as short sellers take their profits. 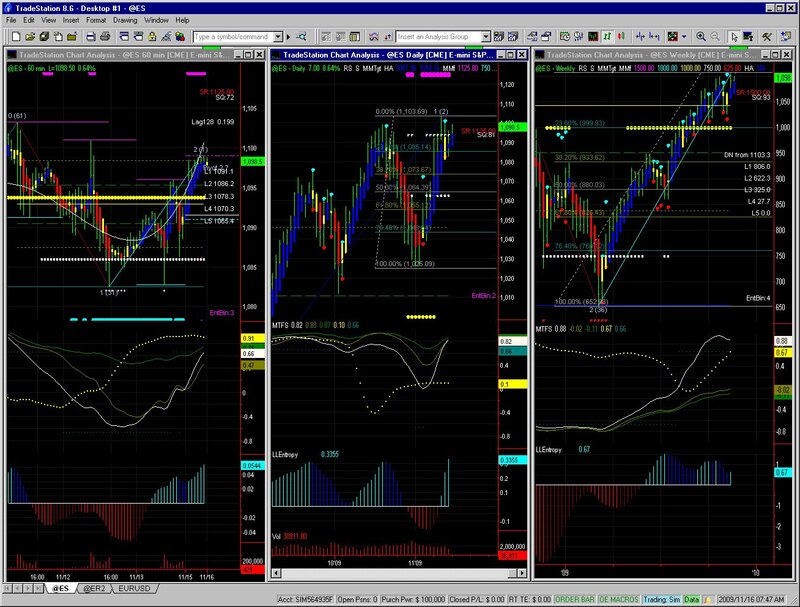 There is no indication that this recovery will last, so we'll just check MM/Fib levels on the daily chart (1052?). TF follows the exact same path, and again shorter time frames are recommended for those looking for entry points in short term retracement trades. The mid term trend is still down even if the markets are obviously hesitant on a strong support level (562 for TF, 1032 for ES). The longer term support will probably be found within the next price segment down. EURUSD also behaved nicely and bounced on our support around 1.464 to now aim at the 1.477 area. We're obviously in a channel and the longer term retracement potential is limited, but may see 1.464 tested again in the next few days. If broken, EURUSD could retrace to 1.44 within a few weeks. We'll come back to this scenario in the coming week. ES fell back to its support level where it bounced unsurprisingly. 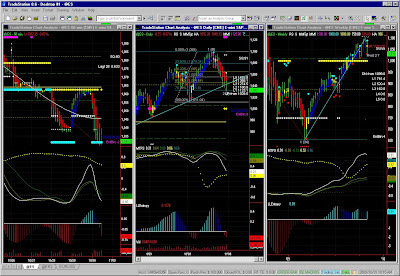 We do notice that lower time frames are more than recommended. ES should aim lower this week anyway, but we'll again check the strong 1032 level for support. Prices should stay low, but above that level today. TF was decidedly below the 562 key level yesterday, which could indicate some further erosion. We are however approaching bounce territory near September lows. Like ES the retracement is now engaged though and prices could shed another 10% in the next few weeks. ES not only turned south again on Friday as expected, but it went straight back to previous lows and further down to strong support level. End of month window dressing probably also caused additional volatility to the market. The market is obviously bearish and the next breakout (a short term bounce is possible on Monday though) will take prices to the next price segment, with a target area around October lows (next stall level also). Note that picking the right time frame is not as easy as it looks, and a 30mins time frame can help determine turning points. TF is also on a strong support on 562. 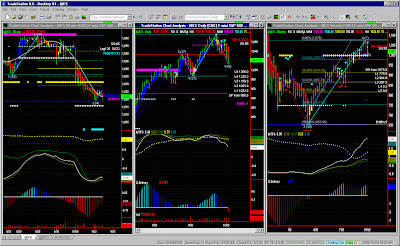 In fact the current configuration is very very similar to ES. A bounce is also possible here but TF is likely to test high 540s and could even reach low 530s later on. It should however not aim back straight at low 510s (weekly) without testing 560 as a resistance, but we'l review this scenario in due course. EURUSD: We've seen clear swings with a drop on strong resistance down to strong support. Does that mean that the US$ will fall again? Probably not. The MTFS crossover is not indicative of a sustainable turnaround. We'll therefore check for the next Fib level for resistance. On the Daily chart, selling pressure is still there, so the current support on the 60mins chart will be tested again, and probably lower to around 1.464 . No change in our longer term outlook. Market reading has been quite easy lately, and many traders must be smiling ear to ear... ES is now on the 60mins stall level and still looking a little bearish. The early MTFS crossover is a classic example of a stall which may translate in a soft landing in the low to mid 1030s. We shall notice again and again our 32 points segments. If this one breaks, we might head onto 1000 again. The Entropy is very low (EntBin=-5) so a bounce is more than likely, however selling pressure is still too strong in the first hours of the day. On the daily chart, we notice the channel boundary, the Fib level and a lot of bearishness, so we'll certainly have to check for a breakout. TF is also coincidentally on a strong support level on both 60mins and daily charts. It is therefore in bounce territory when the selling pressure fades a bit. ES fell to the support level after breaking out. 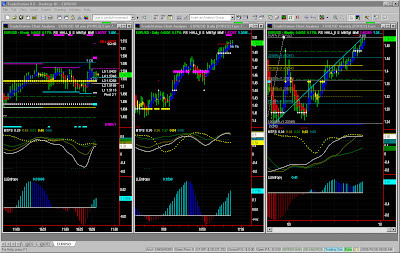 We had anticipated it as prices stayed below the key pivot level and selling pressure accelerated. ES should remain fairly bearish, yet 1062 should hold and a minor bounce is even possible at first. As mentioned on the weekly report, the current support level will determine whether prices will fall to the next price segment or not. It is unclear whether this will happen today or not... but it could in the next few days. TF is also sitting on its strong support level, and since it is a also strong Fib level, a bounce is likely. However, like for ES, we should start preparing for a pullback to the low 500s. EURUSD: we'll check for a channel bottom as we still don't see any major retracement coming. Short term bearish for now. ES has taken a bit of a knock on Friday, but one should not jump into conclusions of the "big one" just yet. It is only normal profit taking at this stage. Indicators on the 60mins chart do show a bounce potential, but 1078 will be key level. If prices stay below it, we can safely assume ES has moved to the lower price segment and will aim at 1062. That level if/when hit will be a lot more crucial going forward. EURUSD: we notice some exhaustion of the Euro, and a narrowing of the range which could lead to a breakout situation this week. The US$ should remain weak in the short term, and a lower time frame is recommended. We'll check 1.502 for support. Yesterday's market action was a little too abrupt for our time frames and i hope you have switched to lower time frames as recommended recently. 1094 is indeed a strong resistance, only a few points away from a Fib target on the daily chart so it is a good price area for the "air hole" also mentioned in recent reports. Having said that, on our time frames at least, we don't see the potential for a the big retracement just yet. We believe prices should drop again today to the low 1070s, but should bounce relatively soon (Check 30mins time frame or lower). Sorry about yesterday... Could not find a minute to connect. ES is finding it difficult on 1094 but it isn't clear yet whether this is the signal for the pullback we've been waiting for. Prices should indeed hover around current levels, and test resistance again. We shouldn't be too far from the peak now so i again recommend moving to lower time frames. TF has already retraced a bit to 610 where a bounce is likely. Same period of hesitation otherwise, so caution must be equally be exercised at these levels, even if we don't anticipate any strong pullback in the short term. EURUSD has hit the target we had on MM stall level. We also notice that the retracement potential on the longer term (weekly) is fading, hence only minor profit taking could slightly affect the current bullishness in the couple of weeks or so. Passing stall level and then the strong 1.51 resistance should prove difficult though, so we'll update our scenario as we get close to target. ES is now on its resistance level on the 60mins chart, and looks still bullish... As mentioned in previous reports ES is aiming to 1125 or at least to the stall level just below. We're anxious to see whether that will be the retracement point we're looking for. TF is also bullish, close to the 625 resistance level but while also looking bullish right now, looks like having less upward potential. We can expect some fighting on current levels, and can't discard a volatility spike in either direction. Stall level is on 1.498 with the strong resistance on 1.501, this is an area where we should see that anticipated exhaustion and likely modest retracement. Sometimes chart reading is easier, particularly in momentum mode when "quantum" levels are visible. ES is now very close to the 1094 resistance level, and residual bullishness should support ES moving higher again. TF which was slightly ahead of ES is now more in sync, and is also inches away from the 625 resistance level, which could prove a lot harder to break. EURUSD: same story... €/$ should hit stall level and probably resistance level around 1.5 later on. While going with the flow, one should always remain cautious about the apparently obvious though. One can't discard the possibility of a sudden bout of selling on target. ES keeps on rising relentlessly... hesitation on highs has now faded so we can expect it to reach 1085 today (maybe 1093). I know i probably confused some readers with my retracement warning on the weekly chart: yes, it is still there, charts are clearly overbought, but the momentum effect is too strong in the short term. TF is now loading correctly again here. 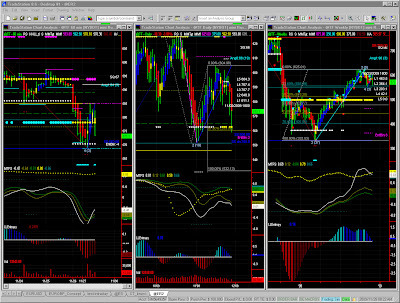 It is moving along with ES and should aim for the stall level or maybe right to the resistance level on 625. Again, we have to realize that the retracement scenario is a little more advanced here than on ES hence TF could lead the forthcoming retracement (next week?). We'll come back to it in due course. EURUSD: US$ is very weak and despite being on a target now (1.489), resistance level could break hence we could hit our longer term target (just above 1.50) earlier than we thought. ES is now testing september highs with some hesitation. It isn't clear whether it will stall now in the short term, but it is probably too early to assume the timing is right for the retracement announced on longer time frames for some time. 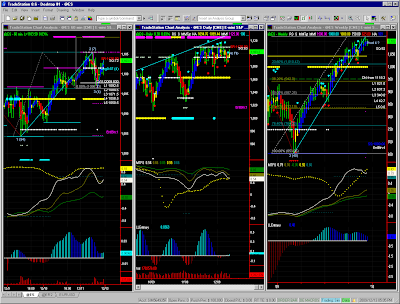 ES will probably try and creep higher, maybe up to the next Fib/MM level around 1125. 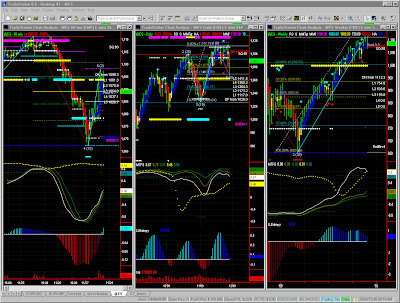 The dominant time frame being the 60mins chart, we'll remain obviously quite cautious. 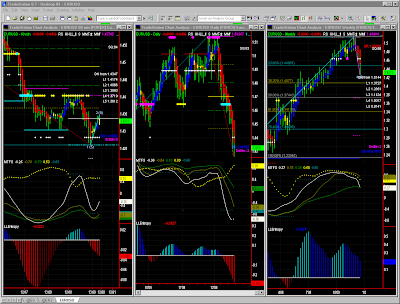 TF hit stall level yesterday. This can explain the current exhaustion, but 625 is just around the corner now and should be tested still. We do notice that TF is definitely closer to the anticipated retracement. ES has crept higher relentlessly the whole week, right to the 1062 resistance level which is still valid even though penetrated on Friday. Since we should always stick to our "go with the flow" guideline, we have to push back our longer term indications of the retracement announced on the weekly chart (EntBin = 5). The daily chart also remains bullish for now, but we have to realize that the 60mins chart IS the dominant time frame by far with a significance level of 88% (only 34% and 31% on higher time frames). ES could therefore either enter into a airhole or test September highs again, or higher to 1125. We're not going to carry on waiting anxiously for the reversal point as it can take a couple of weeks or more. 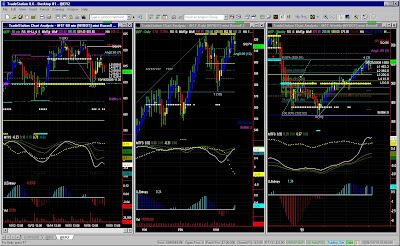 We'll monitor shorter time frames, update our scenario day after day, and as always "go with the flow..."
No TF data (problem with the TradeStation server) so we can 't confront the analysis of our two indices as we always do. We'll try again tomorrow. EURUSD: The situation is not so clear here with some erosion in short waves on the 60mins chart. Yet, on the daily chart, the trading range we've seen since mid-october is still valid, with 1.464 remaining a key pivot level. Like for indices, a retracement potential is quite visible on the weekly chart, but once confirmed (after hitting 1.50 or 1.51 in a few weeks?) such pullback should remain relatively limited (23% Fib retracement at the very most). The upward momentum is fading but is still there in the short term (60mins chart) and we have the same situation of conflicting forces or diverging information at least across our charts. ES could and should stall but could technically creep higher. 1062 remains the key level for the time being. The weekly chart is pointing towards a retracement (EntBin=5) but it can be in the next 3 weeks or more! We'll therefore stick to the 60mins chart for direction. We'll go with the flow with TF also bullish on 610 resistance level, with no indication of a strong retracement initially. It could however retrace to 1st or 2nd Fib level in the next few days if 610 holds. TF tends to tell us that the forthcoming potential retracement on the weekly chart is both obvious yet limited also. Confusing isn't it ? The market will almost certainly try and test one of the key levels we've seen in recent weeks, for support this time. EURUSD: range bound for now. As said yesterday, ES is under conflicting influences, hence "our outlook is still of an upward bias on the hourly chart, of a congestion on the daily chart and of a retracement over the longer term". ES is now on a strong resistance at 1062 trying to go even higher. Taking the risk of looking stubborn, our outlook is unchanged today. TF is on stall level with some residual bullishness, so could reach resistance level on 609. 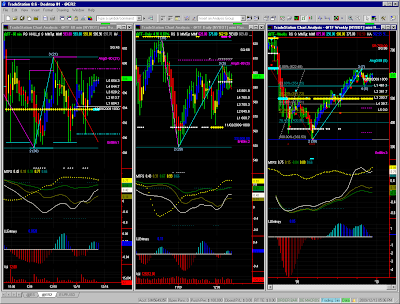 Like ES, it should however stall, congest (daily chart), and eventually retrace (weekly chart). EURUSD: still bullish to 1.477 so we should go with the flow (as always) while remaining cautious. Like indices, we anticipate a peak. Retracement should however be limited. I have to admit the weekly report is a little wrong. We did notice a landing on target with no selling pressure to go lower, but we could not anticipate a jump over the weekend (news?) even if the time was indeed right for a reversal. ES now retraced to the first salient Fib level and still does not convince us of a stronger recovery. Obviously, volatility has been pretty strong over the last week that a move of 1% or 2% up or down would not be indicative of anything but noise. Right or wrong, we keep our target down over the medium term. TF of course also bounced, or should i say, led the bounce since the support level on 578 was certainly obvious. TF also bounced to Fib level and like ES will probably fade over the next couple of days. We'll refine our targets over the next few days. EURUSD broke on the up side and hit about stall level (1.474) close to the 1.477 target. We cannot at this point say that the retracement below 1.45 was the one we expected just yet. We'll have to wait for the weekly pivot to confirm, knowing that chances of a strong retracement are certainly low. Our chart reading went quite well last week. ES indeed landed on 1022 as anticipated, breathing a bit on its way lower. There is not enough selling pressure to justify a Fib target on the weekly chart, so we'll keep a cautious target around the stall level on the 60mins chart (i.e. just below 1010). TF is sitting on a strong support level so the same dynamics may lead to some fighting at first. A floor could be found half a segment (~16 points) lower in the low 560s. Like for ES, we'll then check energy levels to then confirm weekly Fib targets or not. Again our weekly chart does only point towards a minor retracement (16 or 23% Fib at most).